Hatfield, PA, October, 2013 –K’NEX, the only U.S. construction toy company focused on Building Worlds Kids Love®, is pleased to announce the “K’NEX-A-Day Giveaway”, a month long sweepstakes open to K’NEX fans ages 7+. During the K’NEX-A-Day Giveaway K’NEX fans can log on to knex.com and enter for their chance to win a K’NEX building set. The sweepstakes features four different K’NEX building sets with a different building set given away each week. Each day, one randomly selected entrant will be chosen to win that week’s prize. Fans simply visit http://www.knex.com/knex-a-day to enter. From October 1-28, 2013, fans can enter daily for their chance to win the one of seven K’NEX building sets awarded each week. Week One fans could win a 50 Model Building Set, a $29.99 retail value; Week Two, an Amazin’ 8 Roller Coaster Building Set, a $24.99 retail value; Week Three, a 521 Piece Super Value Tub, a $19.99 retail value; finally, during Week Four fans could win a Supersonic Swirl Building Set, a $24.99 retail value. 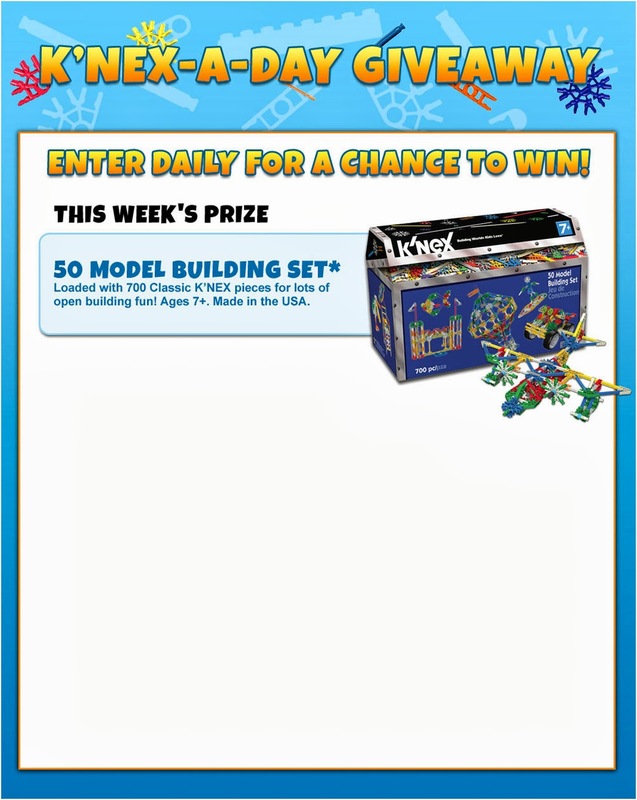 The contest is open to K’NEX fans ages 7 and up and participants can enter once per day. For more information, official rules or to enter visit http://www.knex.com/knex-a-day. No purchase necessary. Founded in 1992, K’NEX Brands, the world’s most innovative construction toy company, was established to make and sell what has become one of the world’s leading integrated construction systems for children and is America’s STEM building solution. Winner of over 250 international awards and recognitions, K’NEX, America’s building toy company, is focused on Building Worlds Kids Love and encourages youngsters to “imagine, build and play.” From the living room to the classroom, K’NEX has building toys specially designed for every age group and skill level. The K’NEX family of brands includes K’NEX Building Sets, K’NEX Thrill Rides, K’NEX Education, Lincoln Logs®, Tinkertoy®, NASCAR®, Angry Birds™, Mario Kart Wii™, Mario Kart 7™, Super Mario™, PacMan™ and more. Since 1992, The Rodon Group, a subsidiary of K'NEX Brands, L.P., has manufactured over 31 billion parts for the K'NEX building toy system. Join us as we help build the leaders of tomorrow. For more information, please visit www.knex.com or www.rodongroup.com.